What happens to a travel blog when the trip has ended? Not much, if recent (lack of) posts are any indication. I’ve been reluctant to write a final summary, as it would mean the trip is really over. Which, of course, it is. We’ve had a temporary home in a cute little Healdsburg cottage for three weeks now. Patrick zips off to an office every day and I’m so close to being employed I actually attended a meeting yesterday. I’m making the most of my last two weeks of free time. The Russian River slips by just out of sight across the street from our house, and all day teens in bright bathing suits traipse past laden with inner tubes and rafts – summer vacation distilled. 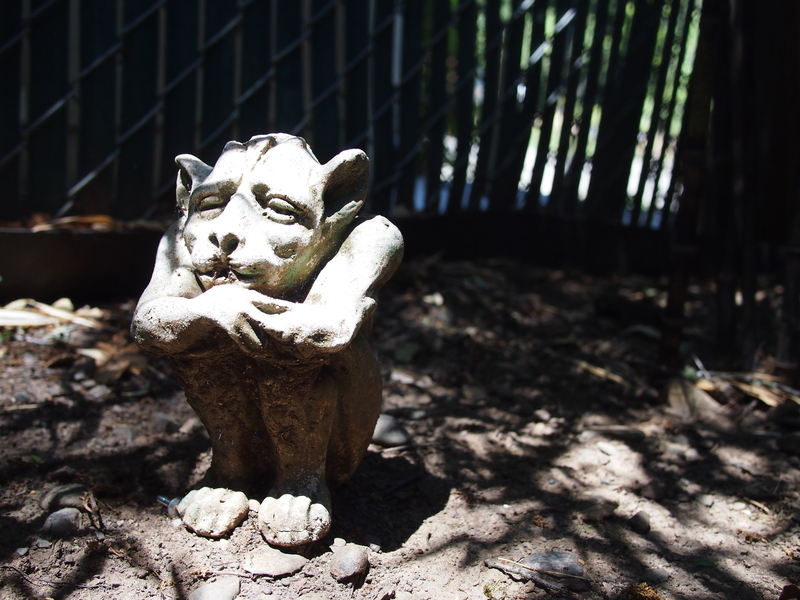 This little gargoyle hangs out at our rental cottage. Someone once told me people in general like change but dislike transition. They were speaking of politics, but the sentiment holds true for other life changes, too. There’s an uncertainty that’s both exciting and disquieting. It took us a few weeks to relax into our traveling schedule and become accustom to being around each other, and only each other, through all our splendid days. Now we’re going through that transition in reverse, getting back in the swing of schedules, responsibilities, deadlines. And then, in nine (!!) weeks, we’ll make that other big transition, from companions to husband and wife. For the time being I feel suspended, neither a wayward traveler nor truly settled. It’s too early to know which memories will be enduring. The mind, old sieve, will filter out what it wishes and in a few years I’ll have a handful of solid moments, like a collection of stones. If I concentrate now, I could recount each day. But I’ll lose more and more moments the longer we’re home. There’s a big hill behind our house. When I hiked up the other day, a squirrel crashed off in the underbrush, and though the air smelled of redwoods and bay laurel, it instantly brought me back to Graham Cave Sate Park in Missouri. In December we stopped there for a walk one cold afternoon, the only visitors as far as we could tell. Hoping to see deer, I was fooled time and time again by gray squirrels dashing through fallen leaves, sounding like animals ten times their size. I look forward to more of those sudden memories. This entry was posted in Adventures and tagged adventure, nostalgia by Propane Kitchen. Bookmark the permalink. Don’t worry, you will continue to have special memories sneak up on you unexpectedly. You may see the way the light looks on a leaf, or smell an aroma or just a special feel to the time of day, and Presto, suddenly you are transported back to a place. You have built up a treasure chest of memories that you will be able to take out and examine and appreciate over and over again. That my dear, is truly being rich! Keep writing, Aimee, whichever way you choose to do it. You have a wonderful gift! Thank you for sharing it. It’s always a pleasure.